Abstract: The GeForce 7800GTX chipset has a simple purpose; to catapult nVidia back onto the 'fastest, most expensive videocard' throne. Summer has come, the birds are singing, the leaves are green, and we have a new graphics chipset from nVidia to write about. Though the prolific 6 month product cycles adopted by nVidia and bitter arch-rival ATI seem to have slowed, it's good to know that the march of progress has not stopped entirely. 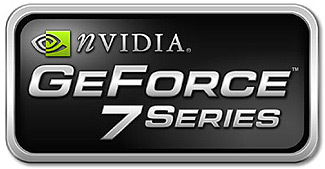 The GeForce 7800GTX chipset has a simple purpose; to catapult nVidia back onto the 'fastest, most expensive videocard' throne. Obviously, it and its inevitable series of ultra-extreme-pro-express offshoots will make up the high-end of nVidia's next wave come christmas time, but for now it's a lone gunfighter with sights set squarely on ATI's X850XT PE videocard. nVidia has stated that the 7800GTX GPU should make any modern game smoothly playable at 1600x1200 with 4XAA when partnered with a current high-end processor. This is not the most ambitious goal in the world, since today's top level videocards can more or less accomplish the same feat. The additional eye-candy that games like Doom3, Half-Life2 and Splinter Cell: Chaos Theory can load on results in multiple complex operations needing to be performed on each and every pixel though, which can seriously stress current generation cards. This is only going to get more pronounced as game manufacturers try to top each other and their own previous releases. The modern videocard is a balancing act then, between having multiple vertex units and pixel pipelines to provide the raw speed needed to render and fill huge polygon counts and the need to perform advanced transform and lighting effects on each pixel in a single pass to maintain that speed. It's kind of like trying to drive at 400Kmph while minutely examining each and every daisy growing on the side of the road. While you wrap your head around that metaphor, we can tell you that nVidia has added features and improvements that make advanced transform and lighting effects much less costly to overall performance with the 7800 GPU. 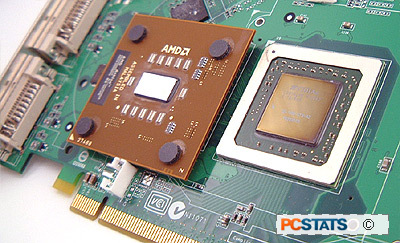 The 'G70' Geforce 7800GTX core next to an AMD AthlonXP 3000+ CPU. Nvidia's GPU is almost 4 times the size of AMD's CPU. The 7800GTX GPU (formerly known as 'G70') is based quite closely on the Geforce 6800Ultra graphics processor. That said, there are several significant improvements and tweaks which should add up to a large overall performance boost. Let's get the nuts and bolts out of the way first. The key architectural differences between the G70 and the 6800Ultra start with the size and manufacture of the GPU. The G70 is based on TSMC's 110nm process and incorporates a mind-boggling 302 million transistors. To put this in perspective, an Athlon 64 FX-55 has only 105.2 million transistors! The nVidia reference design for the 7800GTX runs at 430MHz to start with, and uses 256MB of GDDR3 memory clocked at 1.2GHz. This provides the reference card with a total bandwidth of 38.4GB/s. Internally, the 7800GTX has eight vertex shader units to the 6800's six, and a total of twenty-four pixel pipelines (six groups of four quad pixel operators) to the older GPU's sixteen. The 7800GTX boasts a fill rate of 10.3 Gigatexels, considerably more than the 6800 Ultra's 6.4 Gigatexels. The sixteen ROPs (Render OPerators) are the same amount found in the Geforce 6800 Ultra, meaning that it can't actually render any more pixel data to memory than could the NV40. According to nVidia's marketing folks, this wasn't a bottleneck preventing higher graphics performance.